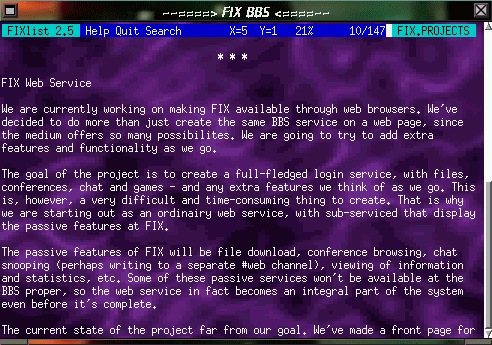 Help system - BBBS comes with a powerful online hypertext helpsystem with a intuitive design spun around the Amiga Guide format. Who-listing - This is the output of a Who-listing (Who's on). Join screen - Here you can choose which conferences you want to join. 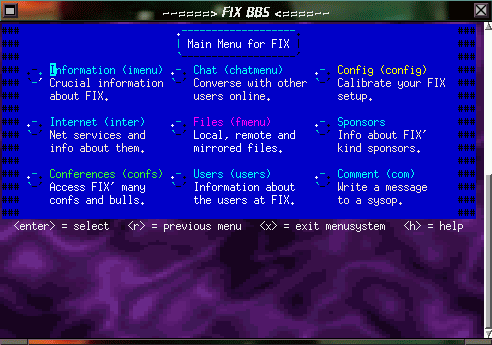 Message thread - BBBS has full message threading. 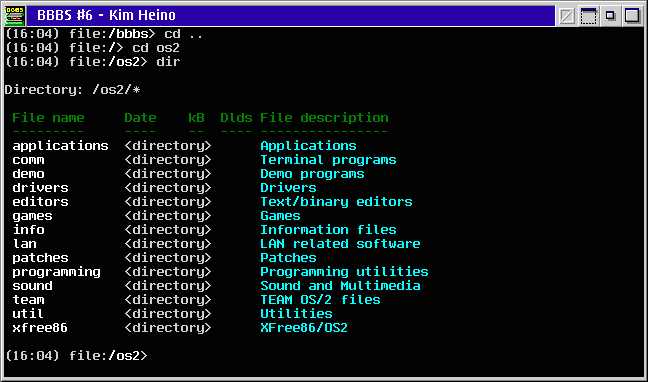 Dirlisting (directories) - BBBS comes with a very powerful filesystem (FILE/4) which is used like a ordinary shell with the familiar dir, ls, type, cat, cd, etc. commands. Dirlisting (files) - This shows the listing of files with description and other information. System Operator's Manual - SysOp's manual is also hypertext manual like the online user manual. 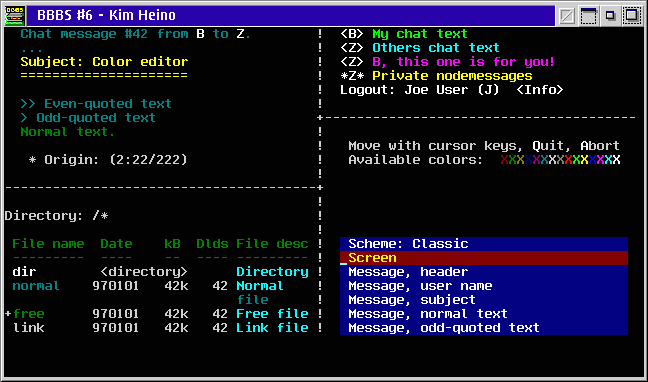 Palette editor - Every user can choose his own favourite colors for messages, who-listing, files, etc. 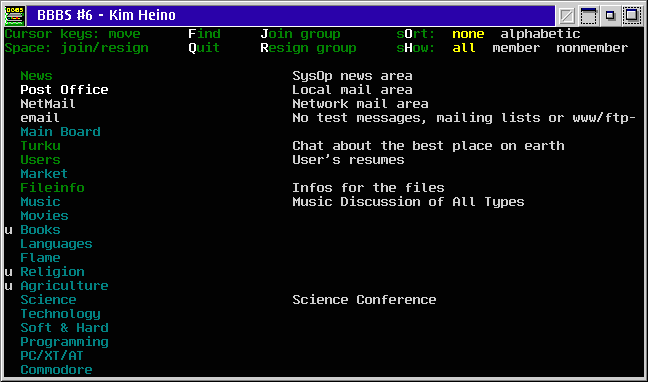 Reading messages - ...you can read messages with GNUS-alike full screen message reader. 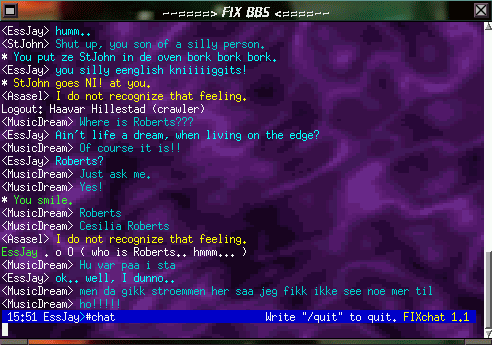 BBBS can also automatically reformat the messages if you want to, in this case left margin set to 2 and right margin justified to 56. 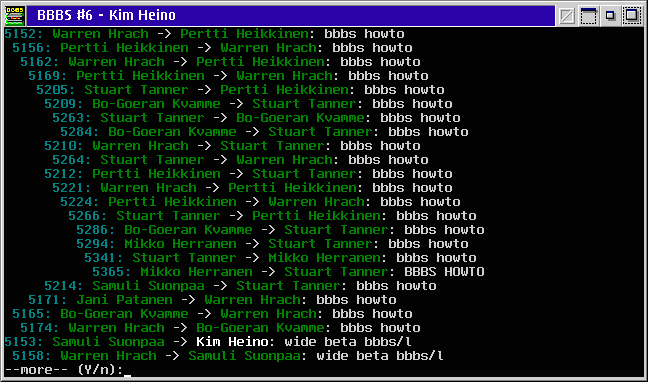 Editing messages - ...you can use MG (GNU Emacs-clone). MG also supports multiple windows. 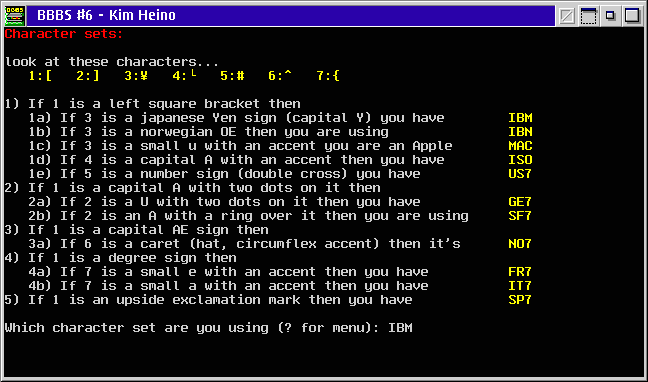 Selecting charset - BBBS supports multiple charsets, like IBM PC-8, ISO Latin-1, MAC, etc. Selecting file transfer protocol - BBBS has lot of internal file transfer protocols, like Zmodem, HYDRA, Kermit, etc. 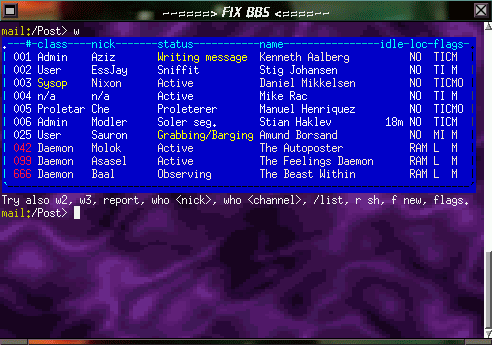 The following are FIX-specific screenshots, to show how it is possible to customize the appearance of a BBBS-board with BZ-scripts. These screenshots were taken by Stig Johansen. 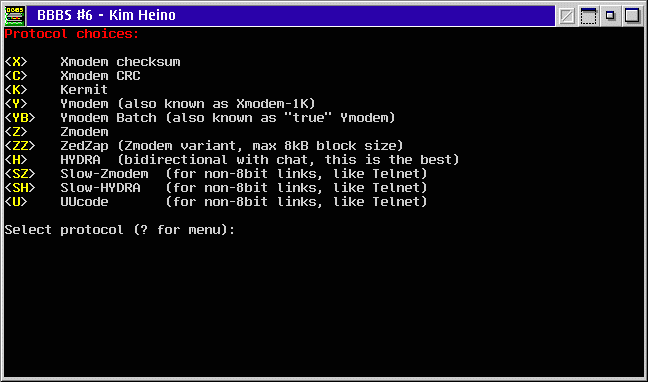 The terminal is a rxvt with a xpm-background and modified foreground-color connected to fix.no. 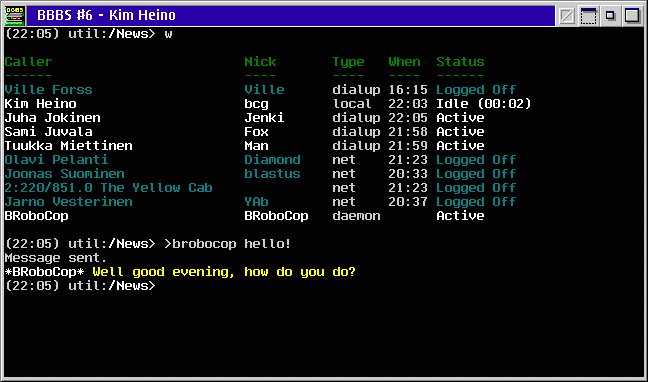 Fix-chat - This is the chat-system made by the guys at FIX. Main Menu (alternative) - The FIX-team has made a interactive menusystem based on 'point-and-click' menus. Information screen - Using the FIXlist program, news and info is displayed in a different manner.